Work Hard. Stay Safe. Live Inspired. We are the first arriving engine on scene to a working fire and our job is to get water on the fire, right? Absolutely, truth be told that once the fire goes out the problems go away. However, determining the methods of attack and weapons of choice are a whole other ballgame. As we know, the first line pulled is the most important line coming off the first engine. Failure in making the right (critical) decision could make for a long night at the office and require more manpower and more work than originally required. On the flip side, having a not so sufficient crew with the correct line in place could also make for a long night. Consider the size up A.D.U.L.T.S (Advanced Fire on Arrival. Defensive Fire Ops. Unknown Location & Extent. Large Uncompartmented Area. Tons of Water Needed. Standpipe Ops. Structure is 60 feet for more from the curb. Will 200 feet of preconnect work? What’s the dimensions of the structure? Will 200 feet of preconnect still work even if the structure is greater than 60' plus feet from the curb? If not, how many feet of hose will it take to make the fire from the door? Is the line being stretched up or down a stairwell? This will add an additional 50 feet to the line. Where is the crew calling for water? Before the door or inside the structure? Are there any obstructions overhead if a dry line is being deployed? Is there an adequate water supply coming in? Most importantly, what’s the level of manpower? These questions could all be answered prior to the call during pre-planning and made efficient during training. As we know each situation is different and when things become routine, it sometimes can be dangerous. Don’t be afraid to think outside of the box and explore non convention ways to solving the problem. Knowing our limitations but also knowing the best ways to use the equipment on the engine is a key role in successful fire suppression. The reason I say that is this, the engine carries water, hose (preconnected and not preconnected), tools of all kinds and firefighters for a reason and by knowing how to use the engine in ways other than always pulling preconnected handlines can make for sufficient, smooth and outside the box thinking firefighters. So next time you’re sitting around the kitchen table or on the bumper of the engine, give an address in your area and ask these questions to the firefighters on the crew and lets see how you’re all thinking. A thinking mind is a valuable mind. Until next time; work hard, stay safe & live inspired. NICHOLAS J. HIGGINS is a firefighter with 17 years in the fire service in Piscataway, NJ, a NJ State certified level 2 fire instructor, a State of New Jersey Advocate for the National Fallen Firefighter’s Foundation and is the founder/contributor of the Firehouse Tribune website. A martial arts practitioner and former collegiate athlete in baseball, Nick is also a National Exercise & Sports Trainer Association Battle Ropes Instructor, Functional Fitness Instructor and Nutrition Coach. He holds a B.S. in Accounting from Kean University, and a A.A.S in Liberal Arts - Business from Middlesex County College. Nick has spoken at the 2017 & 2018 Firehouse Expo in Nashville, TN as well as at numerous fire departments within NJ and fire service podcasts. It’s that time of the year again, furnaces in full force, fire places in use and gas appliances being used more so now than outdoor grills. With this season change the higher expectation of carbon monoxide alarms begin to rise. Why is this a concern? Carbon Monoxide or CO, is a colorless, odorless, tasteless and flammable gas with it being the leading cause of accidental poisoning deaths in America. CO, a byproduct of incomplete combustion of fuel sources such as natural gas, wood, propane and coal to name a few, can be found in many areas of indoor and outdoor living areas such as kitchens, laundry rooms, garages and wood burning stoves and fireplaces. Because of this CO can be generated in 3 ways; through a solid, liquid and a gas. Further, CO could also be “man made” through motor vehicle exhaust, cigarette smoke and cooking appliances yet all use some type of fuel source and generated through a solid, liquid or gas. Annually, several hundred thousand people are exposed to CO poisoning with 20-40% of survivors suffering immediate or delayed neuropsychological deficits and other health damage. One of these is Hypoxic Stress, which is the reduction of oxygen-carrying capacity of blood leading to inadequate oxygenation of cells, tissues and organs. Our brains are susceptible to hypoxia although subtle effects of CO could prevent us from being aware. Earlier, we mentioned cigarette smoke being a man made cause of CO. Well, in a non-smoker the COHb levels in the blood is between 0.4% and 1.4%. In smokers who smoke one pack per day have up to 5% COHb in their blood. Due to this, cognitive ability in longer term smokers has been known to decrease. Is anyone experiencing any symptoms? What appliances were being used prior to the alarm? Try and recreate the situation from what the occupants have done over the last 6-10 hours because it could be a slow leak. Observe the occupants for signs of CO poisoning and ensure they are in fresh air while the scene is being investigated. Check the fireplace, the furnace intake, draft hood, water heater and gas-fed furnace. Ensure gas flames are blue and not yellow or orange, this is a sign of CO.
Laptops or tablets charging. This is rare but could happen. If the source is still unfound, request the local gas and utility company to the scene. Also, if operating in a multi-resident occupancy, check adoring apartments and buildings. Depending on your area, think outside of the box. Does this occupancy have a shared chimney? Is it a duplex? Shotgun house or an odd renovation style? This all could be indicators for unfound CO due to its building construction. Lastly, ensure alarms are in their proper locations in the occupancy and always don your SCBA with readings at or exceeding 9 ppm. NICHOLAS J. HIGGINS is a firefighter with 17 years in the fire service in Piscataway, NJ, a NJ State certified level 2 fire instructor and a State of New Jersey Advocate for the National Fallen Firefighter’s Foundation. A martial arts practitioner and former collegiate athlete in baseball, Nick is also a National Exercise & Sports Trainer Association Battle Ropes Instructor, Functional Fitness Instructor and Nutrition Coach. He holds a B.S. in Accounting from Kean University and is the founder/contributor of the Firehouse Tribune website. Nick has spoken at the 2017 & 2018 Firehouse Expo in Nashville, TN as well as at numerous fire departments within NJ. "This shouldn't take too long." I'm not talking to anyone;that's just the thought in my head as I get ready to clean the bathroom today. On the first floor of my house there is a half bath that is just after the front door, on the right side. It's just close enough to the door that if you pull in to the parking space, Dukes of Hazzard style, and busted through the front door to use the bathroom, you can make it without an 'accident' happening. The bathroom needs cleaning. I go to work using an assortment of cleaners; being careful not to cause a hazardous environment needing 911. Now, it's time to mop. That is also the time things go in a new direction. I go to the hallway closet a few feet away on the other side of the hallway. I see a mop handle sticking up, but there is all this stuff in the way. I start cleaning the closet to get to the mop to clean the bathroom. I now have two bags of things to throw out, brooms and other floor cleaning devices neatly arranged, but no mop. A wide area search (of a townhouse, mind you) leads to finding the mop in another bathroom upstairs. To recap, I have cleaned the closet, to find and clean the mop, so I can finish cleaning the bathroom. But while cleaning the mop, I notice there may be a leak coming from the sink I used. So, after cleaning the closet to get the mop, I found and cleaned the mop, then found the leak, then cleaned up the water from the leak to clean the, uh…what was I supposed to be doing again? At that moment, I see myself in a place I have been before. Perhaps you have found yourself in that same place. I have one thing on my mind to do. In the process of working on that one thing, I accomplish 3 or 4 other things. Never what I set out to do in the first place. Once I realize the situation I am in, it was easy to tell I didn’t use my focus habit.What habit do I use to keep my focus? The yellow sticky note habit. People who have worked with me have seen and made fun of my yellow sticky note habit. I admit, it's definitely a little odd. I can't remember how I got started using it, but I've done if for a while. I take two 3-inch yellow sticky notes and stick them together back to back so the sticky parts are at opposite ends. Now I have a 3-inch paper that I can write on both sides. On only one side of the note, I write the date and everything I want to try accomplish that day. The rest of the day, the list resides in my pocket. Periodically for the rest of the day, I look at my list and see what I have done, and what I still need to do. Whatever I don't finish, goes on the list for the next day. Time has taught me that the size of that paper doesn't allow me to put more on it than I can finish in one day. I stay focused, keep track of my progress, and I can evaluate if what I'm doing is more important that what is on my list. I use this at the station, at the office, and sometimes at home. I get laughs about my list at the station, at the office, and sometimes at home. I find that I am more efficient and productive at the station, at the office, and sometimes, at home. My habit for staying focused may not be for you. It doesn't have to be. We all, however, need some way to keep focused on our intended tasks. Completing tasks, completes objectives. Completing objectives, completes goals. And completing goals is how ordinary people have extraordinary impact. the opportunity to hold positions in the Company Officer's section of the Virginia Fire Chief's Association (VFCA), The Virginia Fire Officer's Academy (VFOA) staff, and as one of the IABPFF representatives to the Fire Service Occupational Cancer Alliance. Nick is one of the many trainers for Firefighter Cancer Support Network (FCSN) to offer awareness and prevention training about cancer in the fire service. Nick has the honor of being one of the many contributors for The Firehouse Tribune. A critical role and sometimes often overlooked or undervalued is the engine company performing a search. Normally, the truck company is assigned to search and rescue operations however due to limited staffing in many departments across the country, it’s not surprising to be on a hoseline and performing a search (also, a value added role). Before we can discuss ways to search off a hoseline, here are a few considerations for conducting search and rescue operations. 1. What areas of the building are being determined as primary search areas? 1. Make it quick. This a quick attempt to remove victim or if on a hoseline, remove the fire and protect the victim. 2. Be quick yet thorough. Check all areas where victims may be even ones that are tenable and safe for a quick search. 3. Trust your senses. Use your eyes, ears and touch. 4. We carry in hand tools for a variety of reasons, use them. Using hand tools to extend your reach off the wall or off your partner can help extend the area of the search and cover more ground in less time. This is especially true for residential homes and small to medium size spaces. As we just discussed the key points of a primary search, here are 2 ways we can search while operating off a hoseline. One way the engine company can search a room is allowing the nozzleman into the search room while the backup completes a search of the room. In some instances, the officer and the backup are the same person. If this is the case, the nozzleman will guide the searcher through the room as if it was a quick oriented search. It is to be noted that the nozzleman should place themselves just inside of the doorway. This will allow the searcher a point of orientation and smoother hose advancement once the search of the room is complete. If this is the fire room, it will allow the searcher to move the victim to a safe place of refuge (if need be) while the nozzleman advances in and suppresses the fire. Same rules apply as if an oriented search was being completed by the truck company. However, this time the nozzleman will advance down the hallway between the adjunct room(s) allowing the searcher(s) and the officer (oriented person) clear access to the room(s). This operation must be predetermined prior to putting in place and practiced before use. From here, the officer will monitor conditions of the room along with the location and status of the searcher. Searchers will use traditional search methods (right or left hand quick primary sweeps of the room). Once completed, the nozzleman and crew will advance. 1. NEVER pass up fire! 2. Use the TIC to ASSIST the search. Never allow it to take OVER the search. NICHOLAS J. HIGGINS is a firefighter with 17 years in the fire service in Piscataway, NJ, a NJ State certified level 2 fire instructor and a State of New Jersey Advocate for the National Fallen Firefighter’s Foundation. A martial arts practitioner and former collegiate athlete in baseball, Nick is also a National Exercise & Sports Trainer Association Battle Ropes Instructor, Functional Fitness Instructor and Nutrition Coach. He holds a B.S. in Accounting from Kean University and is the founder/contributor of the Firehouse Tribune website. Nick has spoken at the 2017 Firehouse Expo in Nashville, TN as well as at numerous fire departments within NJ. We have all heard the word Discipline in many different ways through the course of our lives and careers. For those who listen to the Jocko Podcast know the worddiscipline to be used to explain freedom. As Jocko says, “Discipline Equals Freedom”. So what does discipline mean for us in the fire service? Discipline can mean a lot ofdifferent things. It could mean an act to obey an order or a prescribed conduct/behavior. For me as a firefighter, discipline is doing the right thing even when it isn’t noticed by others and it also means always doing your job. A disciplined firefighter is one that will take pride in his or her job at all times. This person will ensure they are alwaysmentally and physically ready for. They will make sure their uniform and gear is clean and ready to be worn when called upon. A disciplined firefighter will continually take pride in their job by washing the trucks and cleaning the station when needed. They will also tend to all the tools and equipment, ensuring they are clean, fueled, and 100% ready to go. A disciplined firefighter will consistentlykeep training in many different ways. They will read books, articles, and do research on new tools, techniques, and advancements. They will also keep training their bodies physically to be fit for duty. They will make sure to set aside time for working out and eating right. For most, this will become a way of life and hopefully not just for them, but for their entire crew and family as well. Perhaps most importantly a disciplined firefighter will share their knowledge and experiences with the younger members to instill a sense of pride and discipline into the new generation of emergency responders. This is critical because the younger generations look up to those of us who have been around for a long time. They tend to model their behavior and tendencies to that of the more experienced crew members. If we are sloppy, careless, and not disciplined they will also be. On the flip side, if we are squared away and disciplined they will be too. When the bell goes off, everyone needs to know what is being asked of them and what their job is. When working on the fire ground everyone needs to work together to achieve the common goal of solving the problem presented. Being a disciplined firefighter will allow you to do your job efficiently so that everyone goes home. NICHOLAS J. HIGGINSis a firefighter with 16 years in the fire service in Piscataway, NJ as well as NJ State certified level 2 fire instructor and currently a State of New Jersey Advocate for the National Fallen Firefighter’s Foundation. A martial arts practitioner in Taekwondo, Brazilian Jiu Jitsu and Muay Thai as well as a former collegiate athlete in baseball, Nick is also a National Exercise & Sports Trainer Association Battle Ropes Instructor, Nutrition Coach and studying for the Functional Fitness Instructor certification. He holds a B.S. in Accounting from Kean University and is the founder/contributor of the Firehouse Tribune website. The fire service loves acronyms and we have a lot of them. For this discussion we are going to talk about the old acronym for all you truckies out there – LOVERS_U. Before we get into the acronym and details of it, let’s first talk simply about truck company ops. Truck operations involve a variety of tasks; forcible entry, search, rescue, ventilation, ladder operations (ground/aerial), overhaul, etc. Nowadays with the lack of manpower, squad and engine companies may be needed to perform these operations at any time on the fire ground and are equipped with the tools to do so. Some engine companies may need to perform both truck and engine operations due to lack of manpower or the absence of a truck on scene and vice versa for companies who run quints. Well here we are, a truck company; what do we do? 1. Size-up (Yes, truck has its own size up to do). Everything we do on the fire ground calls for a scene size up (and a continual one) to better help us make smart tactical decisions to effectively complete our tasks especially with ventilation. Can this start the LOVERS_U? Hmm…. 2. 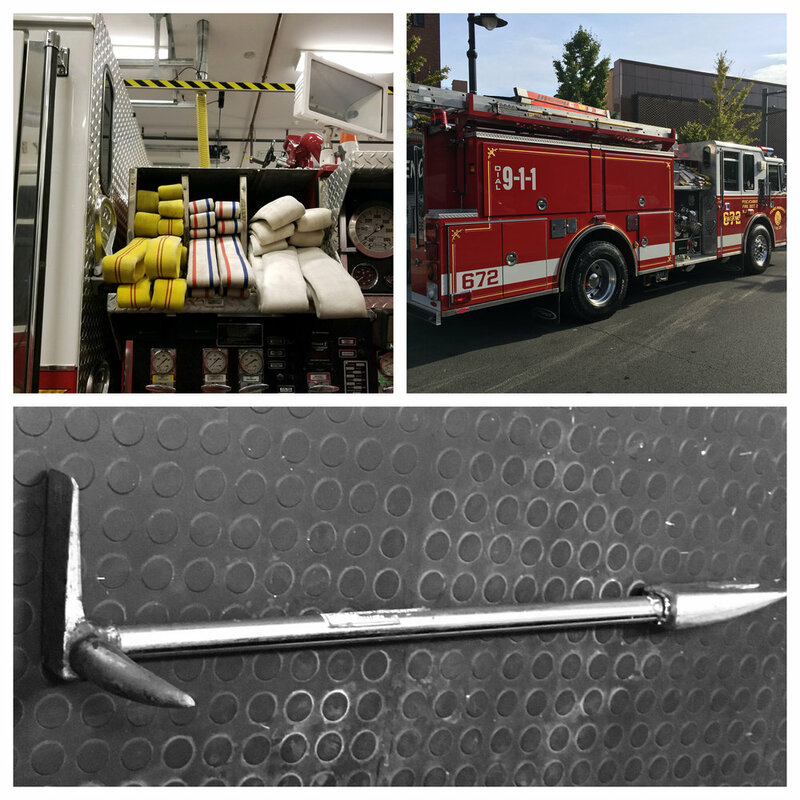 Forcible Entry, if needed (for searching and fire suppression). Sometimes the doors may be unlocked so like they say, “trybefore you pry”. This action should be determined quickly upon arrival in the case of victim removals. Please remember to keep this simple. Remembering your basic tools such as the irons, a hook and/or saw along with variations or combinations of each, can save time and get the job done. The key here is to know your tools and how to use them efficiently. 3. Search (Rescue, if needed). This is very important because we are not only searching for victims but searching for fire both of which may or may not be identifiable from the outside which is why searching is critical on the fire ground. Let’s remember searching for fire can also be done by the suppression team as well. Don’t forget your TIC. 4. a. Ventilation for search team (Vent for life). By venting for life, it is allowing a lot of the thick, black smoke remove itself from the structure giving search teams inside better visibility and time for locating victims. b. Ventilation for fire suppression (Vent for fire). By venting for fire, this assists the fire suppression team in making an easier push to the fire and much easier extinguishment. This is done with very precise communication between your crew, the suppression team inside and the IC. If done haphazardly, this can be catastrophic. 5. Ladder the building (ingress, egress, vertical/horizontal vent). Every window accessible should have a ladder on it for emergency egress and also for access to the roof and 2nd floor windows for vertical vent. Why not throw a ladder up while heading with your crew to your assignment? Kill 2 birds with 1 stone. 6. Overhaul/Salvage. Once the fire is determined to be out, now it’s time to get inside and open the place up. This is to look for any hotspots and perform another search should any victims have not been found. During this operation, SCBA is still required along with a TIC and hand tools. Using tarps are also considered to help salvage as much property as possible and avoid any smoke and/or water damage. 7. Utilities. This is also known as shutting down the utilities. Depending on where the utilities are located, this is done by either an interior crew or an exterior crew. Having control of gas, electric and water will help increase the safety of all fire service personnel on the scene. Now that we discussed primary responsibilities of the truck company, we can now collectively say we have described and discussed LOVERS_U. For all those on truck companies or working with truck company responsibilities keep this acronym in your toolbox when pulling up to a scene, during your pre plans and in your training. It’s a valuable guide to helping you get the job done efficiently, effectively and most importantly safely. NICHOLAS J. HIGGINS is a firefighter with 16 years in the fire service in Piscataway, NJ as well as NJ State certified level 2 fire instructor and currently a State of New Jersey Advocate for the National Fallen Firefighter’s Foundation. A martial arts practitioner in Taekwondo, Brazilian Jiu Jitsu and Muay Thai as well as a former collegiate athlete in baseball, Nick is also a National Exercise & Sports Trainer Association Battle Ropes Instructor and studying for the Functional Fitness Instructor certification. He holds a B.S. in Accounting from Kean University and is the founder/contributor of the Firehouse Tribune website. The engine company’s main job is to go in and put the fire out, right? Well yes but there’s a lot more to it than just that. For starters, without a thorough size up and hose selection, the task of fire suppression may be a bit more difficult than you think not to mention a preplan of your first due structures and strategic and tactical decisions prior to arrival but those topics are for another time and another day. Let’s also not forget any SOGs or SOPs the department has in place regarding fire attack and hose line operations as each department does things a little differently based on factors known to their department. The engine company officer on the first arriving engine they have the job of determining the hose line used for the initial fire attack. This decision is critical to how the operation goes from this point on. Determine your hose line is determine by a few areas. These items listed are critical in determining which hose line is chosen for any given job but not always used based on the job. So, the engine company officer determined which line they want pulled for their initial attack; now it’s time to make the stretch. Simple right? Well not, exactly. First off, practice and coordination with your own crew along with other crews going in will make for a smooth or bumpy initial attack. Determining your length of hose will be based on these areas but remember not all are for each job. 5. Pulling from a preconnecthosebed? The method of entry is key since there are cases the front door may not be an option and a long stretch is needed to the rear of the structure or even a side door or window. In these cases, a preconnect may not be the best option. However, using a high-rise pack can help increase the lengths to your hose line. The location and extent of fire goes hand and hand with the method of entry since a smoother and quicker attack may be warranted by a different means of entry. This will all depend on an initial size up and 360 of the structure which can be done by the chief officer, if on scene before the engine. Normally, residential structures are around 2,600 sq. ft. and most are 2 - 2 ½ stories. The first stretch will determine the rest so make sure the stretch from the apparatus to the FRONT DOOR is estimated properly. After making the front door, it’s now time to determine your stretch to the seat of the fire and knowing where the location and if it is close to a stairwell will help determine this stretch. Keep in mind the rule of thumb for hose stretches is 1 length per floor. Oh, and don’t forget the stairwell if you’re advancing up to a second floor or down to a basement, each flight of stairs will require 1 length of hose. So, we made the stretch and found the fire room, we did it! Well not so fast, there’s still more work to be done. What’s our nozzle? 1. Flows unimpeded from the hose through the bail and out the tip and moves at high velocity. 2. Allows for better reach and deeper penetration before it loses mass and breaks apart. 3. Excellent thermal penetration due to increased mass & velocity of the stream and rapidly cools all radiant heat sources along with the primary fuel source simultaneously. 4. Under heavy fire conditions, it allows for fire knock ahead of you rather than having to move closer to it. Determining the hose size, hose stretch and reach is vital to a successful fire attack. These can be practiced prior to the call in the firehouse, at department burns and through preplanning. These determinations can also be practiced without even pulling hose. Setup cones distances apart and make each cone part of a scene. Make 1 the apparatus, 1 the front door and 1 the seat of the fire. Firefighters will now have to visualize a structure and estimate the lengths of hose needed to make each cone. Granted nothing is better than going out and pulling hose but for quick indoor training to get each other thinking, it does the job. Let’s get out there, train and remember to never forget the basics.